There was no E!, TMZ, or The Daily Mail, but there was a newspaper covering the family drama in 1908. 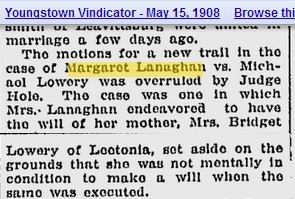 It seems that my 3rd great grandfather Michael Lowry and his daughter Margaret Lowry Lanaghan were fighting it out in court over the status of the will of Michael’s wife Bridget. Great great great grandma Bridget Conley Lowry died on May 8, 1904. Clearly some time had passed before her will was executed. The Vindicator reports that a motion for a new trail (sic) was overruled by Judge Hole. Margaret is indicating that her mom may have been a little cuckoo when the will was written. Next step: Get my hands on that will!